Find the perfect video camera. In many ways, a camcorder is the perfect Christmas gift. In addition to being a great product that will last for years to come, it also lets you capture the day’s yuletide festivities from start to finish. Whether you dream of making the next Australia or just want to stick a video of your dog on YouTube, there’s a camcorder to suit nearly every taste and budget. Below, we have compiled a shortlist of some of the best models on the market, from tiny Net-sharing cams to full-blown high-definition monsters. So grab a pen and paper and start scribbling! (For detailed information on each product, click on the links to read the full review). Referred to variously as webcams, Net-sharing cams and Internet camcorders, these affordable devices are an ideal entry into the world of digital video. They will make a great gift for the kids or people who want to share their movies online (rather than on a TV set). Obviously, video quality is quite poor compared to a fully fledged camcorder, but they remain decent products for the asking price. Most Net-sharing cams come bundled with special software that helps you upload your videos directly to YouTube and other Web sites. MiniDV has been around for over a decade now, but there’s still life in the old dog yet. With prices constantly dropping, MiniDV camcorders represent excellent value for money compared to products that use newer video formats. MiniDV camcorders come in standard-definition and high-definition flavours (the high-def models are usually referred to as HDV). Hard disk drive (HDD) is a very popular format. Instead of mucking around with tapes or DVDs, you simply record your movies directly onto the inbuilt hard drive. 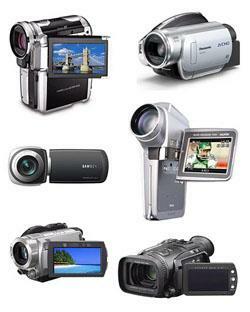 HDD camcorders are available in both standard-def and high-def formats. JVC GZ-MG345 (RRP: $899) "The GZ-MG345 may lack some of the bells and whistles found on its pricier siblings, but it remains a solid performer nonetheless. If you require an affordable camcorder for fuss-free video, you could do a lot worse that this standard-def HDD offering." Flash memory camcorders are a great portable option due to their compact size. Some models are small enough to fit inside a handbag or jacket pocket without weighing you down. Other benefits include longer battery life, sound-free operation and the ability to quickly transfer data to your computer with a card reader. The recording media that these camcorders use comes in several different formats, including Memory Stick, SD/SDHC and MicroSD. They are available in HD and standard-definition. DVD camcorders are a good option for people who want the convenience of instant DVDs. They allow you to watch your videos on a DVD player as soon as you finish recording them, with no need to connect extra cables to your TV. DVD camcorders come in standard-def (which will work on a normal DVD player) and high-def (which requires a Blu-ray player or similar HD device) varieties. Canon HR10 (RRP: $499) "The DC310 is a solid DVD offering. Casual users who want quick access to their home movies will be quite satisfied." If you want to combine the luxury of full high-definition video with a bargain-budget price tag, then look no further than the Kogan Full HD 1080p Video Camera. With a recommended retail price of just $399, it’s easily three times cheaper than the average HD camcorder. While it lacks some of the deluxe features found on its more expensive rivals, it remains a very solid product for the asking price. The Kogan Full HD 1080p Video Camera can only be purchased directly from the Kogan Web site. If you’d like to purchase one or find out more information, click here.